Shiromani Akali Dal (SAD) president Sukhbir Singh Badal thanked Punjabis, especially farm workers, dalits, ladies and youth, for the massive historic congregation held here to gherao the Vidhan Sabha to protest against the Congress government’s failure to implement the Rs 90,OOO crore loan waiver promise. The SAD president said the magnitude of the congregation was itself reflective of the anger of Punjabis against the Congress government and was a severe indictment of its style of governance which had led to back stabbing of every section of society by going back on all pre-poll promises. Mr Badal also condemned the use of lathi charge against innocent agitators who were registering their protest in a most peaceful and democratic manner. “The police resorted to lathi charge without any provocation”, he added. Thanking Akali workers and leaders for their resolve to make the Congress government listen to the voice of the people, he said the protest was such that water cannons ran dry even as Akali workers stood their ground. “I am profoundly grateful to everyone who came here in response to the party’s call be it farmers, dalits, backward classes representatives, angandwadi workers and thermal plant and Sewa Kendra employes. I also have no words to acknowledge the level of commitment shown by the dedicated workers of the party for the welfare of Punjab”, he added. 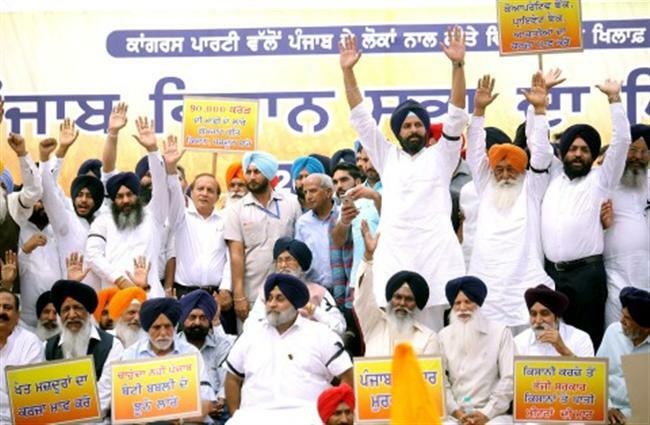 Mr Badal also announced that the fight against oppression and tyranny would continue. “We demand implementation of a complete Rs 90,000 crore loan waiver of all farmers including loans from nationalized and cooperative banks as well as private money lenders. This loan waiver scheme should also be extended to farm labourers and dalits. The SAD president also announced that the party would not allow the government to impose bills on agricultural tubewells. “We will fight this tooth and nail and not allow the government’s nefarious design to impose bills on the agriculture sector to succeed”, he added. Earlier in the morning one lakh Punjabis filled over the sector 25 ground and its neighbouring areas due to their sheer numbers. Akalis marched to the ground and later towards the Vidhan Sabha shouting slogans “Kisani Karja maaf karo”. Khet mazdoor da karja maaf karo” and ‘Na karja khatam na kurki khatam, Congressian di khushki khatam”. Addressing the huge rally, former chief minister Parkash Singh Badal said he had never seen such a big gathering in his life. Mr Badal in an emotional speech said he was ready for any sacrifice, including giving up his life, for the cause of Punjab. He expressed shock and dismay stating never before had any government betrayed its people in this manner. “Many governments have implemented loan waiver schemes. The Congress government can also do it. We provided a relief of Rs 60,000 crore to farmers by reimbursing the State utility for their tubewell bills”, he added. The former CM gave a clarion call to the farmers not to pay their debt. “Capt Amarinder Singh has given you sworn affidavits stating he will give your debts. Now he must fulfill his promise”.